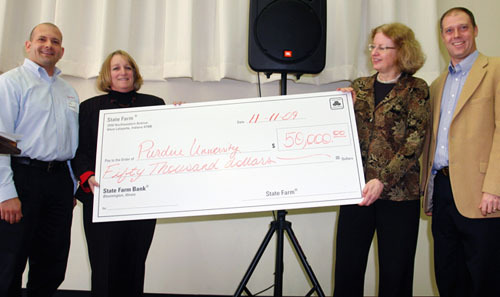 State Farm representatives present Purdue researchers with a check for $50,000. From left to right: Mike Kornafel, Mindy Deno, Susanne Hambrusch, and Phillip Rawles. State Farm presented Computer Science and Computer Information Technology with a check for $50,000 on November 11 in the Lawson Commons. Assistant Head, Dr. Tim Korb, commenced the presentation with a brief welcome. State Farm representatives Mindy Deno and Mike Kornafel addressed faculty, staff, and students gathered for the event and presented the check to Prof. Susanne Hambrusch (CS) and Prof. Phillip Rawles (CIT). Hambrusch and Rawles then discussed how the funds would be used in each college. Thanks to this gift Purdue Computer Science is able to increase its contribution to a national effort focused on training prospective secondary education teachers in computer science. The national effort aims to increase the number of high school educators who are qualified to teach computer science from 2,000 to 10,000 by 2015. It also aims to reverse declining college enrollment in computer science by improving the quality and availability of an advanced computer science curriculum at the high school level. Computer science enrollment at Purdue has seen wide swings, said Susanne Hambrusch, a Purdue professor of computer science involved in the project. Project CS4EDU, started by computer science and education faculty in fall 2009 with funding from the National Science Foundation, will create new pathways for undergraduate education majors to become computationally educated secondary teachers. It plans to create a Computer Science Endorsement program based on the Educational Computing Standards set by the International Society for Technology in Education. In November 2009, CS4EDU will organize a workshop for computer science high school teachers. The workshop will bring together educators and computer scientists and address the challenges and opportunities computer science high school teachers face. This State Farm funded workshop will be crucial in identifying elements a successful endorsement needs to address and it will help build future relationships with computer science high school teachers.